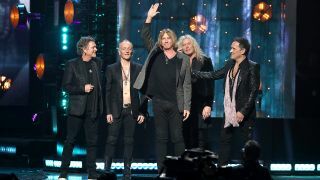 On Friday evening, Def Leppard were inducted into the Rock And Roll Hall Of Fame by Queen guitarist Brian May. May paid tribute to the band’s work ethic and spoke about how they overcame adversity after drummer Rick Allen lost his arm in a car accident and the death of guitarist Steve Clark in 1991. As for their music, May said: “They released 50 singles, most of which were hits and many were number ones. There was this kind of feeling abroad in the press, particularly in the UK, that maybe that made them uncool. Taking to the stage, Def Leppard vocalist Joe Elliott spoke about the chance meeting between him and guitarist Pete Willis in 1977, which led to the birth of the band. Elliott also paid tribute to Willis, who was also enshrined with the band, saying: “Sadly Pete couldn’t be with us tonight, but I want to emphasise how very important Pete’s role in this band was in the early days. Def Leppard then took to the stage to play Hysteria, Rock Of Ages, Photograph and Pour Some Sugar On Me, before coming out at the end of the ceremony to lead an all-star jam of Mott The Hoople’s All The Young Dudes with Ian Hunter. They were also joined by May, Rod Argent and Colin Blunstone from the Zombies – who were also inducted into the Rock Hall on Friday night – Steven Van Zandt and Susanna Hoffs from The Bangles. Stevie Nicks, The Cure, Radiohead, Roxy Music and Janet Jackson were inducted into the Rock And Roll Hall Of Fame.